That’s the slowest part of the book. Jack Keeler has no memory of the day before. He doesn’t know where his wife Mia, an FBI agent, is. He doesn’t know where his daughters are. To the world, he died in an automobile accident. Frank Archer is a retired New York City cop. At 6:35 that same morning, he enters the kitchen to see his wife sitting at the dining room table crying. He knows someone is dead. He sees the newspaper headline that confirms that someone is indeed dead. Jack Keeler and his wife, Mia, were killed when the car they were in fell into the Byram River. Bullet casings found at the scene suggest foul play. As Frank tries to process the information, his cell phone rings; the caller ID shows the call is from Jack Keeler. Under Frank’s questioning, Jack remembers that evidence in one of Mia’s most important cases has disappeared (I hate the term “gone missing” as if things walk away of their own volition). The case is so sensitive that Mia has not discussed it with her husband. The situation becomes markedly worse when Jack finds an intruder going through his home. Frank and Jack subdue the man and put him in the car, planning to take him to a place where he can be kept under the eye of a friend of Frank’s. But before they get to the destination, the man, even with his hands bound in duct tape, escapes from the car and jumps off a bridge, preferring death to facing the wrath of whomever sent him to Jack’s home. Jack had been a New York City police officer until his partner was killed and Jack had to shoot the two teenagers who had tried to kill both cops. Jack was overwhelmed with guilt because of the age of the two killers, overlooking that they had shown no remorse or guilt when they attacked Jack and his partner. Jack decided to continue the fight against crime by going to law school, building a significant reputation as a prosecutor, and being elected district attorney. Frank had come to the police department after spending time in the military. Jack had refused to use a gun after the shooting of the teenagers; Frank was never without his gun. As Jack tries to find Mia, he learns that the missing evidence in Mia’s case is the key to the attempts to kill the Keelers. Bodies begin to mount as another man, a man without conscience or a moral core, makes the Keelers well aware that he holds them responsible for the missing items. Whatever it is, it is tied to a gift . HALF-PAST DAWN is that time when the best of things and the worst of things happen. In the story, it is the worst of times for the Keelers, two of the more sympathetic characters in mystery fiction. The book itself is unusual. Some of the chapters are marked with a day and time. Others have the name of a character. The first suggests the story has a real time aspect to it. The sections devoted to a character are valuable for filling in the background. Yet, the book also plays out in something of an alternate universe. What seems true might, instead, be designed to pull the reader in a different direction. The book is tightly written and stays true to the story even when playing with the characters. 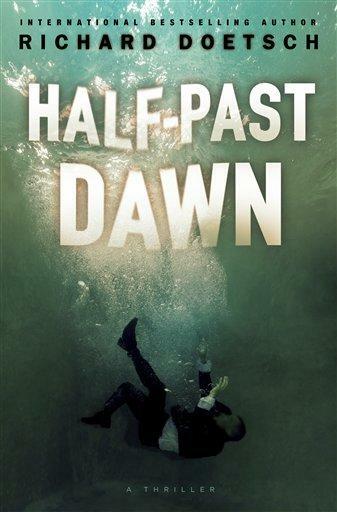 HALF-PAST DAWN is different from the books I usually read so I am glad that I received a copy in the mail. I recommend it. The story is too compelling to be abandoned before the last word and, even then, it doesn’t let go. This entry was posted in Uncategorized and tagged accidental death, case file, district attorney, evidence, FBI, jack keeler, mia keeler, new york city. Bookmark the permalink.